Life is busy. Live your best everyday. 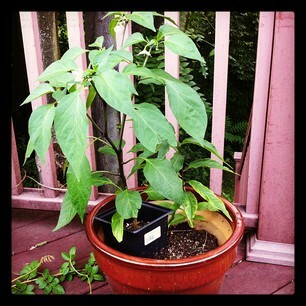 I’ve never had a green thumb. Most of my house plants tend to die. The ones that did survive were the Ikea ZZ plant and miraculously this hand-me-down jalapeno pepper I received from a lady at my puppy‘s playgroup. Since I’ve started simplifying and decluttering my wardrobe through the Glam Save Style Challenge, I’ve found the time to learn how to garden. 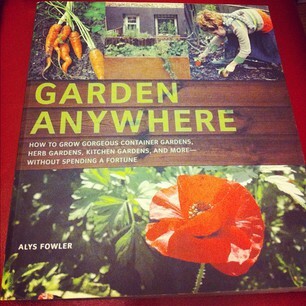 Alys Fowler‘s Garden Anywhere from Anthropologie‘s clearance section in Boston has become my nighttime reading. (It sat on my bookshelf for awhile though.) I always wanted to start a garden but never knew where to begin. 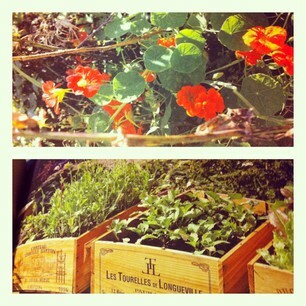 Anthropologie always had some gardening books and garden-inspired displays which piqued my mild interest in gardening. 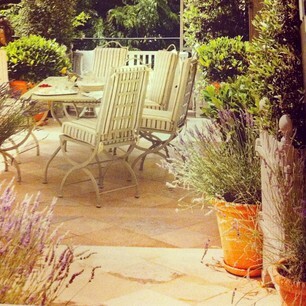 I was also inspired by Lauren Santo Domingo’s garden in Paris featured in this month’s Vogue. Those large terracotta pots of lavender along with the purple salvia, bay, jasmine and roses reminded me of my mental note to start a garden (more for herbs and veggies, although flowers would be nice too). Seeing those pots made me think how container gardens seem like a good way to start since they’re smaller than traditional gardens and seem easier to manage. Nowadays with the drought affecting food prices, now may be a good time to learn how to grow some of our own herbs and vegetables. I remember after reading Barbara Kingsolver‘s Animal, Vegetable, Miracle and Michael Pollan‘s In Defense of Food how I’d wanted to try to find some small way to go back to the land. This is one way to start. Thanks for stopping by! Please subscribe via email or RSS for updates below.